Some of the best feedback related to my teaching and tools that I use in the classroom has come from my students. In the past, I have used short half-sheet questionnaires or surveys to get feedback from my students. This has always proved to be beneficial, but I feel that I get the most honest feedback from anonymous google forms. Because students know that their handwriting and name are not tied to their response, they are more likely to share their honest thoughts and comments. For instance, when I first started to use ClassKick for warm ups, the overwhelming response in class seemed to be negative and included a lot of groaning and eye-rolling, but several students mentioned later, through a survey, that they thought the warm ups were very helpful for their learning and wanted to do more. 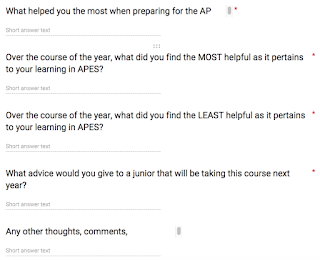 Most recently, I asked my APES students about their preparation for the AP test and based on the responses have some changes in mind for next year. Some of the questions I asked my APES students while the test was still fresh in their minds. Google forms also provides nice visuals, such as graphs and pie charts, to help get a more global summary of responses. The results are also saved as long as you keep the form in your google drive. 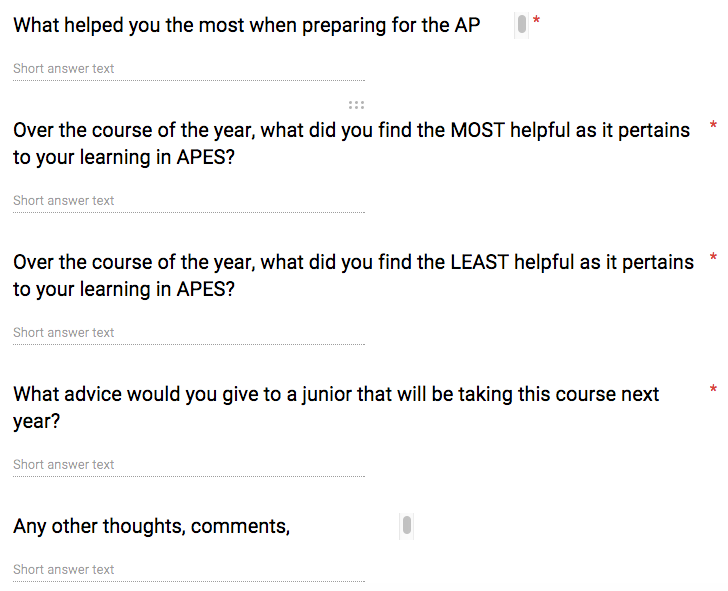 Asking students for feedback gets you an array of responses - some that are well thought out, some that are brutally honest, some that don't help, and some that you might disagree with. As a whole, it's a process that I have found to be incredibly insightful and one that I will continue to use.